Tasco RD-1 pre-molded reusable ear plugs stand out from other no-roll reusable ear plugs because they have an unusually long central stem. This extra long tab allows for simple push-in insertion and quick and easy removal every time. To make things even easier, these ear plugs come complete with an inserter, which makes it even easier to safely seat each ear plug within the ear canal. Like other no-roll ear plugs, Tasco RD-1 plugs are a hygienically sound choice, as you never have to touch the part of the ear plug that goes in your ears with your hands -- you can just simply handle the plugs by the stem. This provides an "instant fit" that is comfortable, properly adjusted, and ready to provide the full NRR 24 protection from noise that these ear plugs offer. 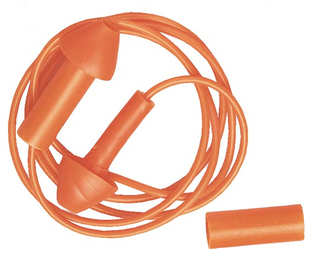 One pair of CORDED earplugs.